Name Variation Carrie A. Edmonds was also known as Carry. Married Name circa 1898 As of circa 1898,her married name was Swab. Carrie A. Edmonds was born in February 1875 at Pennsylvania. She was the daughter of Thomas Sylvester Edmonds and Mary Spyker. Carrie A. Edmonds married John S. Swab circa 1898. Carrie A. Edmonds died after April 1930. Carrie A. Edmonds had 2 with 2 living in 1910 children. [S246] U.S. Federal Census 1880 U.S. Federal Census, by Ancestry.com, Roll: T9_1136; Family History Film: 1255136; Page: 214.2000; Enumeration District: 198; Image: 0430. [S245] U.S. Federal Census 1900 U.S. Federal Census, by Ancestry.com, ED82. Dwelling 38. [S244] U.S. Federal Census 1910 U.S. Federal Census, by Ancestry.com, ED71. Dwelling 163. [S243] U.S. Federal Census 1920 U.S. Federal Census, by Ancestry.com, ED116. Dwelling 230. [S250] U.S. Federal Census 1930 U.S. Federal Census, by Ancestry.com, ED32. Dwelling 12. Name Variation John S. Swab was also known as J. S.
John S. Swab was born in April 1871 at Pennsylvania. He married Carrie A. Edmonds, daughter of Thomas Sylvester Edmonds and Mary Spyker, circa 1898. John S. Swab died after April 1930. Myrtle E. Edmonds was born in October 1880 at Pennsylvania. [S245] U.S. Federal Census 1900 U.S. Federal Census, by Ancestry.com, ED78. Dwelling 159. Name Variation Roland C. Edmonds was also known as Rolin. Name Variation Roland C. Edmonds was also known as Rolon. Roland C. Edmonds was born in May 1867 at Pennsylvania. He was the son of Thomas Sylvester Edmonds and Mary Spyker. James C. Swab was born circa 1904 at Pennsylvania. He was the son of John S. Swab and Carrie A. Edmonds. Mary S. Swab was born circa 1906 at Pennsylvania. She was the daughter of John S. Swab and Carrie A. Edmonds. Thomas B. Swab was born circa 1912 at Pennsylvania. Married Name Her married name was Brenner. Rachel (?) married (?) Brenner. Rachel (?) was born circa 1845 at Russia. Rachel (?) had 5 with 5 living in 1910 children. [S244] U.S. Federal Census 1910 U.S. Federal Census, by Ancestry.com, ED124. Dwelling 4. (?) Brenner was born at Russia. (?) Brenner died before 1910. Married Name Her married name was Diamond. Sarah Label married Leon Bernard Diamond. Leon Bernard Diamond married Sarah Label. Henry Putzel married Helen (?). Married Name Her married name was Putzel. Helen (?) married Henry Putzel. Walter C. Watts was born circa 1901 at Kentucky. He married Margaret (?) circa 1927. [S250] U.S. Federal Census 1930 U.S. Federal Census, by Ancestry.com, ED70. Dwelling 25. Married Name circa 1927 As of circa 1927,her married name was Watts. Margaret (?) was born circa 1905 at Texas. She married Walter C. Watts circa 1927. Name Variation Freda Monn was also known as Fredia. Name Variation Freda Monn was also known as Frida. Married Name circa 1896 As of circa 1896,her married name was Jans. 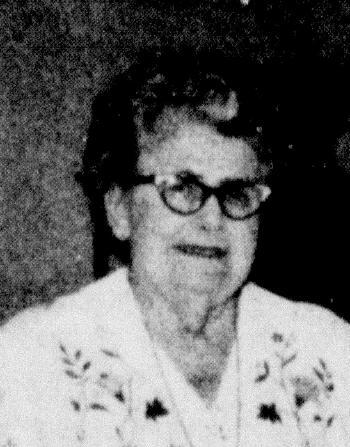 Freda Monn was born circa 1878 at Germany also reported as Iowa. She was the daughter of Joe Monn and Dora Yoward. Freda Monn married Charles F. Jans, son of Peter Jans and Wilhelmina C. Albert, circa 1896. Freda Monn died after April 1930. 1 January 1925 Sioux, Plymouth, Iowa Freda Monn appeared on the census of 1 January 1925 in the household of Charles F. Jans at Sioux, Plymouth, Iowa. Freda Monn had 7 with 7 living in 1910 children. [S244] U.S. Federal Census 1910 U.S. Federal Census, by Ancestry.com, ED157. Dwelling 23. [S243] U.S. Federal Census 1920 U.S. Federal Census, by Ancestry.com, ED129. Dwelling 91. [S250] U.S. Federal Census 1930 U.S. Federal Census, by Ancestry.com, ED27. Dwelling 48. Virgil Clarence Onnen was born on 30 August 1934. He was the son of William August Onnen and Freda A. Jans. Virgil Clarence Onnen died on 10 February 2001 at age 66. Virgil Clarence Onnen obtained US Social Security Card at Nebraska; last residence Milton, Santa Rosa, Florida. Clinton Marlin Onnen was born on 23 October 1941. Clinton Marlin Onnen died on 4 July 1998 at age 56. Clinton Marlin Onnen obtained US Social Security Card at South Dakota; last residence Albuquerque, Bernalillo, New Mexico. Donald Fay Onnen was born on 7 November 1931. Donald Fay Onnen died in August 1981 at age 49. Rosie Jans was born circa 1897 at Minnesota. She was the daughter of Charles F. Jans and Freda Monn. Lena Jans was born circa 1901 at Minnesota. Minnie Jans was born circa 1903 at Minnesota. Clara Jans was born circa 1905 at Minnesota. Edna Jans was born circa 1913 at Minnesota. 1 January 1925 Sioux, Plymouth, Iowa Edna Jans appeared on the census of 1 January 1925 in the household of Charles F. Jans at Sioux, Plymouth, Iowa. Marie A. Jans was born circa 1915 at South Dakota. 1 January 1925 Sioux, Plymouth, Iowa Marie A. Jans appeared on the census of 1 January 1925 in the household of Charles F. Jans at Sioux, Plymouth, Iowa. Carl M. Jans was born circa 1917 at South Dakota. He was the son of Charles F. Jans and Freda Monn. 1 January 1925 Sioux, Plymouth, Iowa Carl M. Jans appeared on the census of 1 January 1925 in the household of Charles F. Jans at Sioux, Plymouth, Iowa. Married Name Her married name was Monn. Dora Yoward married Joe Monn at Germany. Dora Yoward was born circa 1860 at Germany. Joe Monn married Dora Yoward at Germany. Joe Monn was born circa 1858 at Germany. Married Name 10 April 1912 As of 10 April 1912,her married name was Daniels. Maude E. Graff was born on 18 January 1877. She married Nelson Everette Daniels Jr., son of Nelson Daniels and Janett Burdick, on 10 April 1912. Maude E. Graff died on 27 September 1984 at age 107. Aaron Burr Franklin was born circa 1802 at New York. He married Elizabeth Courter before 1824. [S249] U.S. Federal Census 1850 U.S. Federal Census, by Ancestry.com, Dwelling 78.